Committee for a workers' International - International rally in Barcelona on 17 July – For a Socialist Republic of Catalonia! International rally in Barcelona on 17 July – For a Socialist Republic of Catalonia! On 17 July in the ‘Cotxeres de Sants’ in Barcelona, a major international rally in solidarity with the mass movement for a Socialist Catalan republic will take place, organised by Esquerra Revolucionaria and the CWI. Here we publish the text of a leaflet being used to publicise the rally. The historic day of 1 October 2017 was a turning point for Catalonia and the Spanish state: more than 2 million people exercised their right to self-determination and defeated the repression launched by the PP and neo-Francoist state apparatus. These developments which have been recorded into the collective memory of the Catalan masses, opened a revolutionary crisis which has still not been put to bed. Despite the political prisoners and exiles, the criminalisation of the CDR committees, the trials against teachers and Left activists, the mass movement has responded with force to the agressions of the reactionary block of Spanish nationalism and article 155. These events cannot be separated from the fall of Rajoy and his corrupt government. The defeat of the PP reflects the deep crisis of Spanish capitalism and of the regime which sustains it, and is a direct result of the huge social mobilisation in Catalonia and in the rest of the state: from the great feminist strike of 8 March and the rebellion of the pensioners to the massive demonstrations in the Basque country for the freedom of young imprisoned activists in Altsasu. 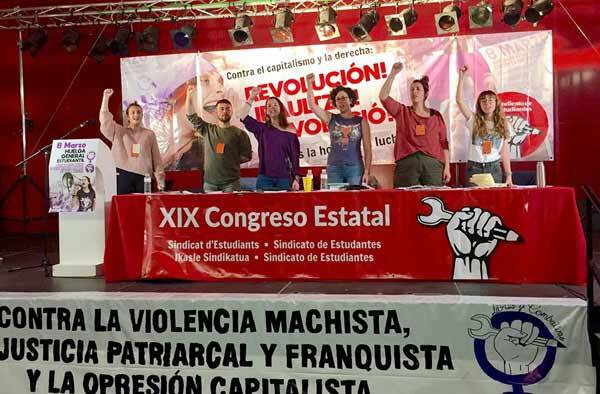 Esquerra Revolucionaria (CWI in Catalonia), the CWI and the Sindicat d’Estudiants invite you all to a major rally of international solidarity on 17 July, in which revolutionaries from Ireland, Scotland and the Basque country, among others, will speak. In the face of those who would renounce the mandate given by the people on 1 October and demobilise us, the consistent Left must raise the banner of a Socialist Catalan Republic, won on the basis of an anti-capitalist programme, through mass mobilisation and fraternal international solidarity in struggle with all the world’s oppressed.